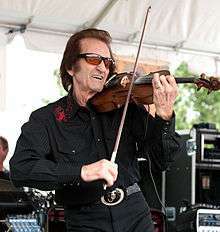 Doug Kershaw playing the fiddle at the 2009 Festivals Acadiens et Créoles. Rusty and Doug Kershaw, 1950s. Although the brothers initially sang in French, J. D. "Jay" Miller, owner of the Feature Records label, persuaded them to incorporate songs in English into their repertoire. In 1955, Doug and Rusty recorded their first single, "So Lovely, Baby." Released on the Hickory label, the tune went to number 14 on the country music charts. 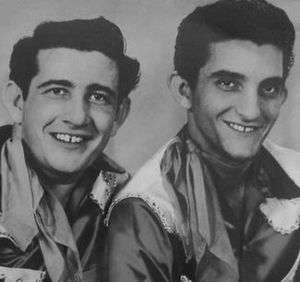 Later that same year, Doug and Rusty were invited to become cast members of the Louisiana Hayride cast. The Kershaws appeared at the Grand Ole Opry in Nashville, Tennessee and became regular members of the Opry cast the following year. In June 1969, Kershaw made his first network television appearance on the debut of the Johnny Cash Show. He capped the year with a week-long engagement at the New York City's Fillmore East as opening act for Eric Clapton's Derek and the Dominos. While it seemed to many rock and pop fans that Kershaw had appeared out of nowhere, he had already sold more than 18 million copies of the records he had made in the early '60s with his brother, Rusty. "Louisiana Man" had been a Top 10 country hit in 1961 and its follow-up, "Diggy Liggy Lo", had done almost as well. His performance in front of a national audience led to Warner Bros. Records signing him to a long-term contract. In July 1969, he performed at the Newport folk festival with peers Joni Mitchell, Arlo Guthrie, Ramblin Jack Elliot, Big Mama Thornton, and Mimi Farina, among others. Newcomers that year were Don McLean, James Taylor, and Jerry Jeff Walker. In November 1969, "Louisiana Man" was broadcast back to earth by the crew of the Apollo 12 moon mission. Beyond the southern venues, Kershaw became widely known in mainstream America as he played at major urban concert halls. In 1971, Kershaw had a musical cameo in the Western film Zachariah, starring Don Johnson and John Rubinstein. Despite the success of his solo career, Kershaw was plagued by depression and sorrow. His father had committed suicide when he was only seven. Marrying his wife, Pam, at the Houston Astrodome on June 21, 1975, Kershaw began raising his own family that included five sons – Douglas, Victor, Zachary, Tyler, and Elijah; and two grandsons and a granddaughter. His son, Tyler, plays drums in his band as well as manages his shows. Although he continued to perform and record, his albums of the 1970s failed to duplicate the commercial successes of "Louisiana Man" and "Diggy Liggy Lo". In 1988, he recorded a duet, "Cajun Baby", with Hank Williams, Jr., that became a Top 50 country hit. Kershaw released a French-language album, Two Step Fever, in 1999, and Michael Doucet of Beausoleil is featured on the duet "Fievre De Deux Etapes". Hot Diggity Doug was released in mid-2000 and Still Cajun After All These Years followed in early 2001. His brother Rusty died on October 23, 2001. Doug's third cousin is country music star Sammy Kershaw. 1969 The Cajun Way — — Warner Bros.
1981 Instant Hero — — Scotti Bros. The Best of Doug Kershaw — — Warner Bros.
1 2 3 Simmons, Michael (March 1, 2003). "Doug Kershaw: The "Real Deal" in Cajun Fiddle". Fiddle.com. Retrieved 2014-08-11. 1 2 3 McCall, Michael; Paxman, Bob (2012). The Encyclopedia of Country Music. Oxford University Press. p. 263. ISBN 978-0195395631. 1 2 3 "Doug Kershaw Bio". Cmt.com. Retrieved 2015-10-17. ↑ Stambler, Irwin (2000). Country Music: The Encyclopedia (3rd ed.). St. Martin's Griffin. p. 233. ISBN 978-0312264871. ↑ "Opry Timeline – 1950s". Opry.com. Retrieved July 10, 2012. ↑ Woodstra, Chris (1997). All Music Guide to Country: The Experts' Guide to the Best Country Recordings (1st ed.). Backbeat Books. p. 255. ISBN 978-0879304751. ↑ "Richard De La Font Agency, Inc: Doug Kershaw". Delafont.com. Retrieved 2014-08-11. ↑ "Arlo Guthrie - Alice's Rock And Roll Restaurant / Ring-Around-A-Rosy Rag (Vinyl)". Discogs. Retrieved 2015-10-17. ↑ Greenspun, Roger (January 25, 1971). "Zachariah (1970) Screen: 'Zachariah,' an Odd Western". The New York Times. ↑ "Grand Funk* - Phoenix (Vinyl, LP, Album)". Discogs. Retrieved 2015-10-17. ↑ Morris, Edward (October 23, 2001). "CMT: Rusty Kershaw, of Rusty & Doug, Dead at 63". Cmt.com. Retrieved 2014-08-11. ↑ Haas, Kyle (May 28, 2008). "Bayou House closes its doors". Greeley Tribune. Retrieved 2010-01-27. ↑ Phil Hardy, Dave Laing Da Capo companion to twentieth-century popular music 1995– Page 510 "Doug Kershaw's demonic instrumental style, however, made him much in demand for recording sessions. ... Swamp Grass (1972) had a heavy-rock emphasis while Devil's Elbow swung towards psychedelic music and Douglas James Kershaw ..."